I absolutely love the books in this series. Every single page has you busting out laughing. It's a short read with a big boost of fun. Harmony is one spunky, sassy witch I will give her that and her friends haha or shall I say house guests? A Donkey whose female stole the Pink Lady, A parrot who doesn't shut up about Harmony's rear and a cat who thinks the zombies are coming next month. 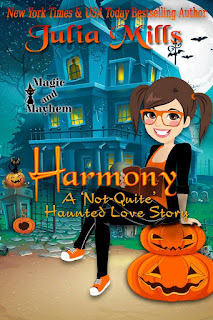 Yep, a barrel of laughs and oh yea we get some creepy crawlies and a ghost who has the hots for Ms.Harmony but how will she handle that? Grab your copy and find out what I laughed so hard at.